A committee of the Dublin parliament has recommended that Travellers be recognised as an ethnic minority to combat discrimination as the issue begins featuring in local election campaigns in the 26 Counties. 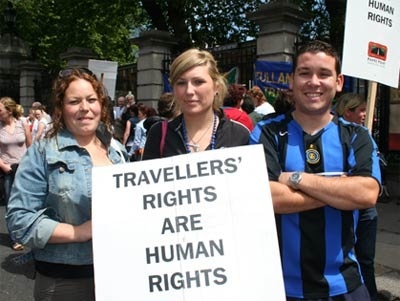 The Joint Committee on Justice and Equality, in a report, said it is “no longer tenable for this State to deny Traveller ethnicity” and that it is “long past time for this State to honour our responsibilities to the international conventions on human rights”. A scientific analysis of Irish DNA three years ago claimed that Travellers separated from the main population here between one and two milleniums ago for reasons that are unknown. The gypsy-like community maintains its own ‘cant’ dialact and other customs and traditions which differ markedly from the settled Irish community. The report called on Minister for Justice Alan Shatter to make a statement in the Dáil announcing the State’s recognition of Traveller ethnic minority status and says the government should then contact relevant international bodies confirming this recognition. The recommendation comes after a long campaign by Travellers for such recognition, support by human rights organisations, including the United Nations and the Irish Human Rights Commission. The UN Committee for the Elimination of Racial Discrimination expressed concern at the 26-County state’s “persistent refusal” to recognise Travellers as an ethnic minority, and pointed out that they satisfied the internationally recognised criteria for such a group. The Dail’s justice committee held a series of hearings on the issue last year and produced the “Report on the Recognition of Traveller Ethnicity”, written by its rapporteur on the issue, Sinn Fein TD Padráig Mac Lochlainn. Mr Mac Lochlainn, from Donegal, who has family links to the Traveller community, last year introduced legislation which, if passed, would have recognised Traveller ethnicity. The chairman of the Fine Gael parliamentary party Charlie Flanagan has criticised the parliamentary report’s recommendations which he said had the air of “political correctness” about them. Progress on the matter seems unlikely, with traveller support organisations forced to condemn the tone of election leaflets distributed around Dublin by government election candidates. In one leaflet, a Fine Gael member of South Dublin County Council told residents she was “delighted to announce” proposed Traveller accommodation would not now proceed, while another Fine Gael candidate described other plans to build Traveller accommodation in the Mount Anville area as a “dreadful waste of taxpayers’ money”.